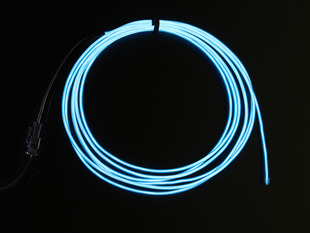 After a couple of back and forth visions between LEDs and EL wire, we have decided to tentatively pursue the path of EL wire, and have begun experimentation with said product. 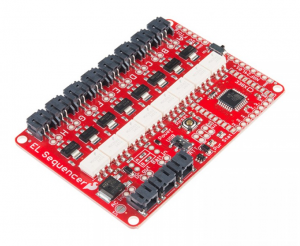 To control the wires, we have purchased a EL Sequencer from Adafruit, which is essentially a standard Arduino solely built for the purpose of controlling EL wire. Wiring the microcontroller was fairly simple. The EL wires plug into the 8 outputs on the far left side. The 12V inverter is plugged from a 12V wall converter into the bottom most port, and provides the near 90V AC that the EL wires need. For testing purposes, the FTDI basic breakout board (see below) was attached to the 6 pins at the top. This board provides a way to connect to a computer through a USB mini B cable, in order to push programs made in the Arduino IDE to the controller. The FTDI breakout board also provides the necessary DC voltage to power the board. The next step is to power the board wirelessly. In order to do so, we have to remove the FTDI breakout board and the DC power associated with it. As a matter of fact, the EL Sequencer was actually manufactured with battery power in mind. The third black port from the bottom is where a DC battery is to be plugged in, in which a standard 9V battery now sits. In addition, the inverter has to be powered by battery that outputs 12VDC; we obtained a Lithium ion battery for this task. With everything hooked up, any program that was previously pushed to the Sequencer will now run completely free from the laptop. If, however, another program needs to be pushed to the Sequencer without wire, or if there is some user input in the Arduino IDE, we need some way to communicate with the board. Luckily, the Sequencer was not only made to be powered by a battery, it also has some ports for an XBEE module. In order to communicate with the Sequencer, a second XBEE needs to be plugged into the laptop that has the Arduino IDE. With all of that wired up and soldered in, the XBEE modules are ready for testing, to see what can be sent between the modules.